Kylie Jenner, makeup business mogul, reality star and influencer is becoming the youngest self-made billionaire ever, ahead of Mark Zuckerberg, who became a billionaire at age 23, according to Forbes. 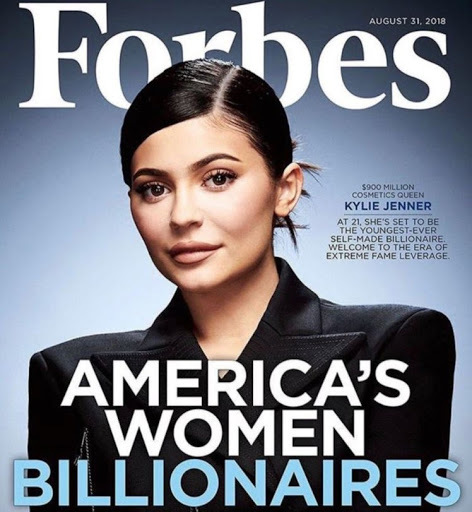 The youngest Jenner, who is on the cover of the August edition of the American business magazine, is on the ‘America’s Richest Self-Made Women’ list. The ranking, which is in its fourth year, collates America’s most successful self-made women entrepreneurs and executives as measured by their net worth. The 20 year old Kylie, who is the youngest of the Kardashian-Jenner sisters, is worth 900 million dollars and is tipped by Forbes to become the youngest billionaire in the world. The new mother of Stormi Webster came into limelight from her appearances in her family’s television show ‘Keeping up with the Kadarshians’. other women including her sister Kim Kardashian, media mogul Oprah Winfrey, singers Beyonce and Taylor Swift who also made the list. Describing Kylie’s business success, Forbes wrote on its website, “Jenner runs one of the hottest makeup companies ever. “Kylie Cosmetics launched two years ago with a $29 “lip kit” consisting of a matching set of lipstick and lip liner. “It has sold more than $630 million worth of makeup since, including an estimated $330 million in 2017. “Even using a conservative multiple, and applying our standard 20% discount, Forbes values her company, which has since added other cosmetics like eyeshadow and concealer, at nearly $800 million. Jenner owns 100% of it. 0 Response to "Kylie Jenner Now Richer Than Beyonce, as She Becomes Youngest Female Billionaire"